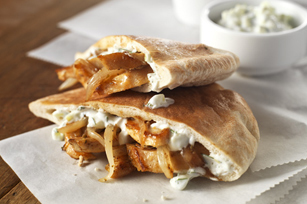 Get your Greek on with this Chicken Gyro Recipe. Cucumbers, sour cream and fresh dill mean creamy, crunchy and delicious gyros right at home. Combine first 5 ingredients. Refrigerate until ready to serve. Cook and stir chicken in 2 Tbsp. dressing in large nonstick skillet on medium-high heat 6 to 8 min. or until chicken is done. Remove from skillet; set aside. Add onions and remaining dressing to skillet; cook 5 min. or until onions are crisp-tender, stirring occasionally. Return chicken to skillet; cook 2 to 3 min. or until heated through, stirring occasionally. Spoon chicken mixture into pita bread halves. Serve topped with cucumber mixture. Serve gyros topped with chopped tomatoes and ATHENOS Traditional Crumbled Feta Cheese in addition to the cucumber mixture. Substitute 4 pocketless pita breads or flat breads for the regular pita breads. Spoon chicken mixture onto bread; top with cucumber mixture. Fold in half to serve.